The Strategic Materials team was also very conscious of future planning when strategizing for this website redesign. They have always been known for being technological leaders in the industry and they plan to expand the use of technology in operations as well. The new website couldn’t just be a new design, it needed to be a design that is flexible enough to grow with Strategic Materials. The new website can expand to include new sections and resources as needed to best communicate their business and activities. Content Management System Control: Using TBH Creative’s content management system, the Strategic Materials team has the ability to keep their site up-to-date as they continue to grow and expand. Responsive design: The new design doesn’t just bring a fresh look to the monitor—it brings a fully responsive design so that Strategic Materials presents the same brand identity to their audience no matter what device is being used. Restructured site architecture: The previous website did a decent job covering basic services. However, as an acknowledged leader in the industry, Strategic Materials wanted more. 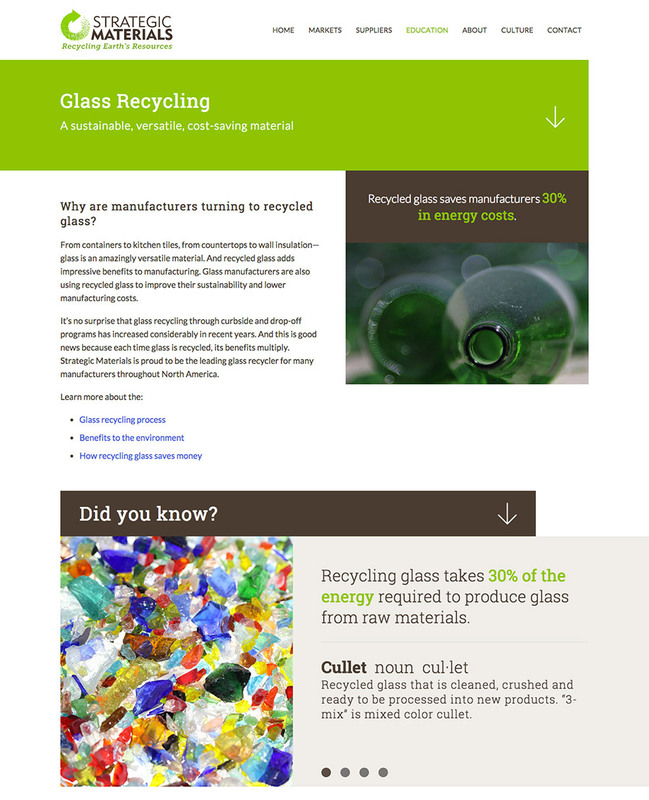 We restructured the site architecture to include a section with education about both glass and plastic recycling as well as expanded content about their business processes. Custom website tools: With locations across North America, a key goal of the project was to make it easy for customers to locate and find the Strategic Materials location nearest them. 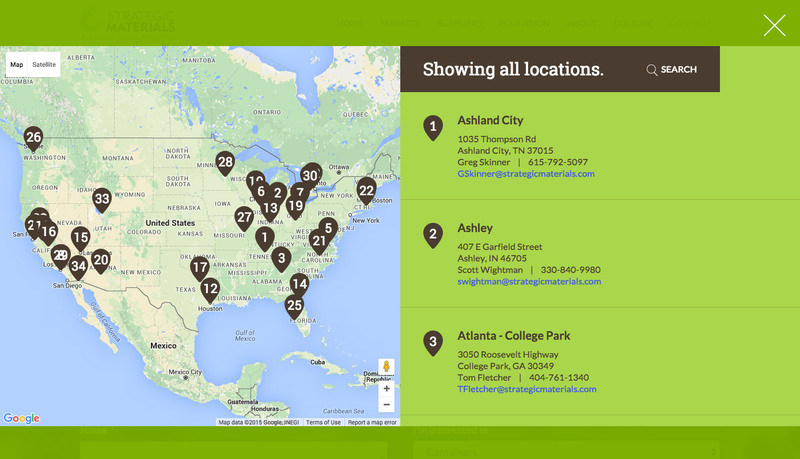 Our customized location tool matches the modern styling of the site and is very easy for the user to find the nearest location and person to contact. Professional photography: The website uses a careful mix of stock photos and custom photography work taken on-site and in studio. The new design relies on strong visual communication and it was important to have accurate, powerful photography. A clear understanding and desire to make the most of their website. 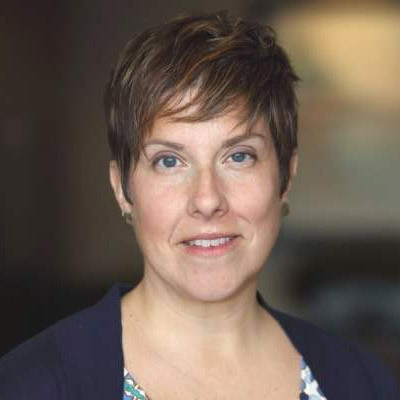 Strategic Materials knew from the beginning what they wanted from their website and were willing - and eager - to take the time for strategic planning up front. The end result is much stronger and more flexible for future growth because of it. Upgrading subsidiary websites using the microsite technology built into our Content Management System. Expand the education section to further demonstrate Strategic Material’s position as an industry leader. New content likely to include videos, infographics and articles. When I started the design project with TBH Creative, all I knew was that I didn't like my current site and wanted something better and different. TBH Creative was able to take that broad statement and translate it into a design that was modern and fresh but still appropriate for my type of business. They proved to be both talented in design and diligent in project management. The combination of these skills led to a new website that I am extremely proud of. Tatum and her team were a joy to work with and I look forward to working with them again on our next project. 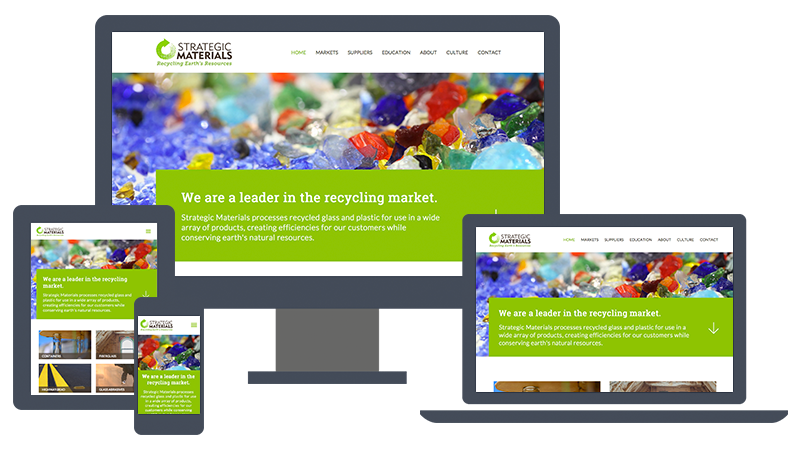 With 40 plants across North America, Strategic Materials is the largest glass recycler on the continent. Recycled materials from Strategic Materials are utilized to create a wide range of products used in daily life, including: fiberglass insulation, food & beverage containers, reflective materials, and other consumer and industrial products.